I recently started to collect the green penguin crime paperbacks. Introduced by Allen Lane in 1935, the Penguin main series was intended to open up book buying (and reading) to the general public. 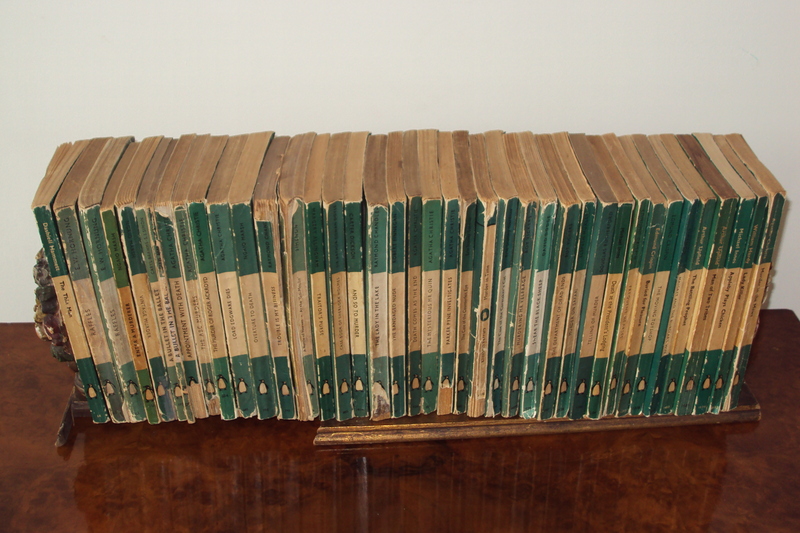 They were first sold in Woolworths for 6d and the crime books in the series were colour coded green. Once upon a time you could pick up early penguin crime books cheaply but now the going rate seems to be about £4 for a standard edition, and up to around £40 for the early editions. My collection is in its early stages as you can see by my picture below as I am only buying them as quickly as I can read them. I hope one day to have a row of books similar to Karyn’s who writes the excellent A Penguin a Week blog although my bookshelves would be a sea of green. I picked up recently picked up Elspeth Huxley’s Murder on Safari – number 1129 in the series. Huxley was brought up in colonial Kenya and the majority of her early books were crime novels set in Africa. Murder on Safari features Vachell, the Canadian superintendent of Chania CID who is sent to a luxury hunting camp to investigate the disappearance of some jewels. When the victim of the theft is killed, attention focuses on each member of the hunting party. As a period crime novel, the book isn’t bad. There is a limited pool of suspects who could have committed the crime and the reader is presented with a possible motive for each suspect. The characters are well drawn and sufficiently interesting for you to care who committed the crime. The descriptions of the Kenyan bush is interesting too and I liked how the luxury that existed within these camps – guests swilling champagne in their silk pajamas – contrasts with the perilous landscape outside. However, I would say that the book has dated in terms of its vocabulary. There are broad generalisations made about the physiognomy of native Africans that is unacceptable today. Huxley does attempt to include some of the Africans into the plot as witnesses to the action but these scenes are not well written. Perhaps it is unfair to highlight stereotypical descriptions of indigenous people, as Huxley is by no means the only writer guilty of this. I have just finished listening to a talking book of Agatha Christie’s They Came to Baghdad where the descriptions of the Arab locals is equally poor. But if we are going to try to resurrect some of the less well read authors of the period for the modern reader, it is worth pointing out that some writing has just simply dated. Murder on Safari is now out of print but easily available second-hand. Yes it’s becoming increasingly difficult to find the green paperbacks in general second hand book shops. The book fairs usually have them. Sarah – Excellent post! It is interesting how some novels stand the test of time even if they use terminology that wouldn’t be acceptable today. I’m so glad you spotlighted Huxley – she had talent. Thanks for the mention, Sarah, and the introduction to Elspeth Huxley – Penguin no. 1129 is one I am still yet to find. The aspect I particularly enjoy in finding and reading these old Penguins, and especially the green ones, is this opportunity to discover interesting authors that have fallen from favour. My favourite so far has been Michael Innes, although it took me a while to become accustomed to his style. Thanks Karyn. I have a Michael Innes to read in my collection so maybe I will try him next.